A relationship relates to a maze of special interactions which occur over time. It emanates from a deep knowledge and experience in dealing with people`s needs & wants. At Duly’s, we understood over a long time that our tie-up with a network of our customers required more attentive thoughts, a conviction to serve, smart objectives, well–defined responsibilities and energy to trudge on even when challenges came thick and fast. As we give an account of how Duly’s managed to retain its customer base since 1902, you will notice that our adoption of Kenneth B. Elliot’s Customer Pledge, among other factors, provided within Duly’s DNA, the understanding that a customer is not an outsider to the business, but a part of it. If you visit any Duly’s branch today, you see the Customer Pledge neatly tagged on customer waiting area walls. The prudential move provided the impetus for a sustained conviction to serve is evident in Duly’s service culture. 1894: Charles Duly arrived in Bulawayo as part of the Pioneer column. He opened a saw and grain mill which was sold a year later. 1895: Opened a cycle store - the first development in road transport. 1897: Partnership formed with Mr. A. E. Bourne, and a branch opened in Gweru, selling cycles, arms and ammunition. 1901: Opened a new branch in Harare, under the management of Mr. H. A. Pratt. 1902:Charles Duly brought the first motor car to Zimbabwe – a French “Gladiator” a 6.5H.P, later followed by Humberette, Star, Di Dion and other makes. 1911: A new branch was opened in Kadoma, with Mr. R. L. Juul as manager, and the Ford Franchise was acquired with a contract of 60 cars per year. 1912:A limited liability company was formed, under the name of Duly & Company Limited, with Messrs. C. Duly, A. E. Bourne, W. Harris and R. L. Juul, as the Board of Directors. 1914: Just prior to the outbreak of World Wars I, a new branch was opened in Masvingo. Mr. J. S. Steer was the first manager. 1918 Many of the staff of Duly & Company Limited, headed by their Managing Director, saw action in the Forces. 1919: The Company imported the first tractor into Zimbabwe – a Fordson. 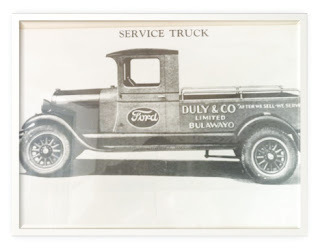 1929: Duly & Company Limited grew from a business into a tradition and established its name synonymous with Ford. 1930:A big step was taken in the development of the Company by expanding outside of the territory, when a branch was opened in Ndola, Zambia, to serve the large Copper Mining ventures in the area. Six other branches were opened later, but the company sold out its entire interest in that country in 1969. 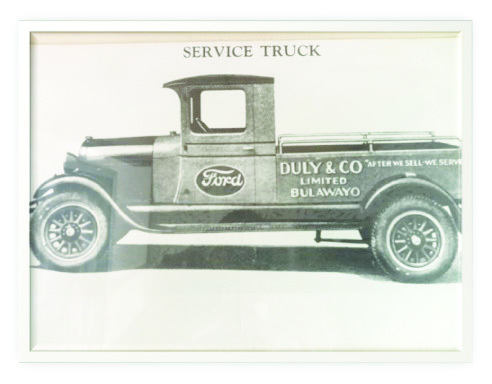 1932:The Company opened a Bulk Parts Depot in Harare, bringing the amenities of the Ford Factory nearer to Ford owners. Mr. L. A. Veary was the first manager. 1936: A new branch opened in Mutare, with Mr. Cecil Duly, the founder’s son, as manager. 1939-945: World War II slowed up the development of the Company. 1946-1959: The complex trading of the “post war years” brought its trials and challenges, but the tradition of the Company to sell quality products, suitable for conditions in these territories, at the lowest possible price, and to give service to the public, was maintained. 1960: A new branch was opened in Rusape under the management of Mr. H. J. Swart. 1961:The eighth branch of the Company was opened in Marondera with Mr. M. Pring-Rowe as manager. 1964: To cater for the large-scale agricultural development in the Low-veld, a new branch was opened in Triangle, managed initially by Mr. I. E. Holshausen. 1968:The Company’s network was extended by the opening of its tenth branch, in Chinhoyi, under the management of Mr. A. F. S. Millar. 1975: The Company proudly opened its new complex in Harare - one of the largest and most modern garage premises in Southern Africa. 2015:Engaged in a special synergy with Croco Holdings to become the biggest automotive group operating in Zimbabwe which embraced franchises such as Nissan, UD, Volvo, Renault, Eicher, Yutong, Higer, Ford, Toyota & Kia. 2017:New Holland Agriculture and Construction Equipment franchise granted. Apart from the conviction to serve and retain customers, success was a result of a well-knit maze of measures. Relationship needs identification enabled Duly’s to have an insight into customer expectations and this involved getting to know the customers better by finding out products that would better address their needs. The act also involved listening to and analyzing what customers said about its own products and services. As a result, in line with tenets of the Ansolf matrix, existing products and services which appealed to the existing market were availed over the years and these included light vehicles such as Ford, Mazda, Renault, BMW, Ford Tractors and implements. Furthermore, entirely new products for new markets also came into play, for instance, Nissan Diesel and Aeolus Trucks were launched followed by Volvo Group products such as UD, Volvo, Eicher and Renault Trucks. These were brought onto the market to cater for the production needs of the primary production sectors of a growing industry. Still further, products were also enhanced to appeal to new markets and from time to time, new and upgraded products were introduced for more markets. Thus over the years products with augmented applications were introduced in line with technological developments. This saw the introduction of more vehicle products, Nissan formerly Datsun, for instance introduced pick-ups, king cabs and double cabs. On the other hand, redundant products were phased out & replaced by enhanced versions, for instance, Duly’s introduced a new range of buses such as UD, Volvo, Yutong, Higer & Eicher buses and the New Holland range of tractors replaced the Ford tractor brand. Apart from designing products and services, managing relationships also involved managing quality. For continuity of this massive project, proper management of quality required a clear mission & vision, a well-defined quality service delivery policy, a quality strategy and a quality system which embraced targets and a feedback mechanism. These measures enabled Duly’s to build loyalty from individuals, families, social groups, primary producers in agriculture and mining, manufacturing sector entities and the services sector. Agriculture & Construction:New Holland Tractors, Balers, Combines, Back Hoe Loaders, Rollers, Graders, Skid Steer Loaders. In addition, in a coordinated effort with local financial institutions, a wide variety of financial packages are in place to suit a wide array of customers’ vehicle asset replacement and service needs. Furthermore, in a bid to better manage customer relationships and achieve service provision excellence, every branch has well-trained personnel who include the Business Unit Manager, Accountant & Clerical Staff, Service Manager, Workshop Foreman, Journeymen, Workshop Assistants, Service Advisor(s), Parts Supervisor and Clerical Staff, Vehicle Sales Consultant(s). Thus the after-sales support network is hinged not only on the aforesaid key strengths, but also on a robust parts supply network, well-equipped modern workshops, product user training, an efficient breakdown recovery system, service reminders and an effective complaint handling system. These tools are in place at every Duly’s branch to ensure customers have peace of mind during the lifetime use of their vehicle products. In this journey of over a century, we came, we saw and we conquered and it is our pledge to REMAIN OPEN FOR BUSINESS and continue to do more for our diverse mix of customers and ensure that they have a delightful experience of our new vehicle products, service and operations today and the bright future ahead..